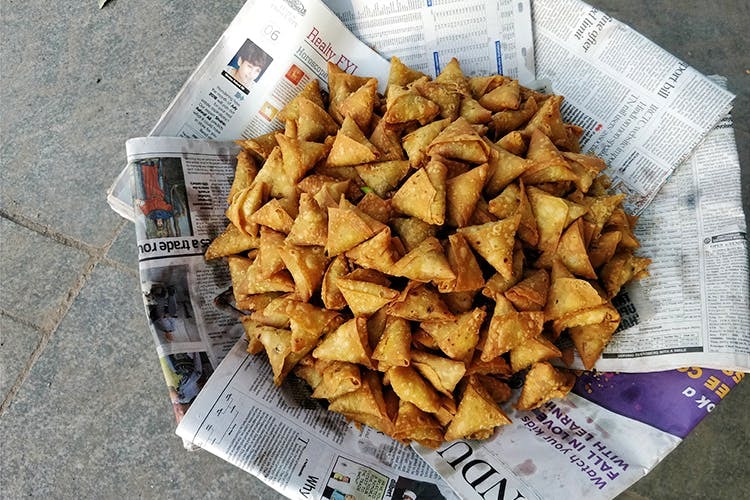 Have You Eaten These Legendary Samosas From Murugesan Anna Yet? Murugesan Anna has been selling mini samosas for the past 10 years along the streets of Anna Nagar. You can get 4 fresh samosas for INR 10. If you’re a resident of Anna Nagar, you’ve probably seen Murugesan anna walking the streets of with his basket full of piping hot samosas. We found him near a snack stall at Anna Nagar West on a Friday evening and had to try these. For INR 10, we got four tiny samosas, that were hot and super crunchy. We also liked the spicy filling that consisted of potatoes, onions and channa. Murugesan anna said he has been selling samosas for the past 10 years now and frequents Anna Nagar East and West areas. Well, it makes sense as he lives in Anna Nagar. We couldn’t take a picture of him as he’s a bit camera-shy. If you want to try these delish samosas, you can find him near Kartik Tiffen Centre, or opposite Nilgiris in Anna Nagar West around post 4pm. Pack them home and pair it with a cup of hot chai to ace the evening snack game! He doesn’t have a contact number and you can't find him on Google, but you can find him at Anna Nagar during evenings carrying his bamboo basket full of samosas!